In September 2013, I cast on a really decadent project. I bought, for the first time, a skein of Wollmeise Lace-Garn. 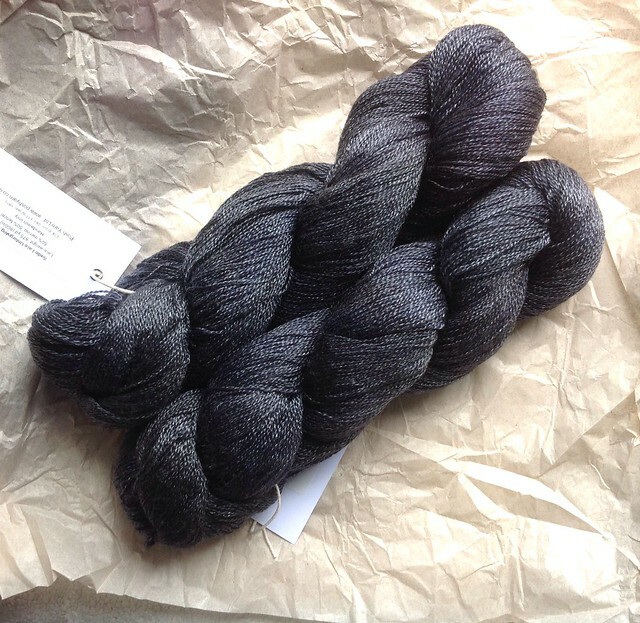 It was not cheap and as I was buying it from an update on the Wollmeise website, I simply bought one of two skeins that were still available when I refreshed the site, without really thinking about the colour, which was Kornblume. I cast on and talked about starting this project back in September 2013 and that seems to be the last you've heard of it. That doesn't mean I haven't been working steadily on Viajante in the background, even taking the odd picture just in case I decided to blog about it. I've included this photo because I didn't get to use it anywhere else and I'm quite proud of the colour accuracy in it! I think my budget busting purchase, was money well spent, because I have worked on this project steadily since I cast it on. There have only been a couple of weeks, due to deadline pressures, where it wasn't touched. Other than those weeks, it has been picked up every week even if it was just for an hour or two during socialising. To me, spending money on a project that provides many hours of pleasure using beautiful yarn is well worth breaking a budget once in a while. I loved working with this yarn. It was bouncy and soft and pretty. However, it has many plies and this can mean it is easy to split the yarn while knitting, especially if you are chatting. I was so pleased to finish this project, that I blocked it without really inspecting the fabric of the Viajante before hand. 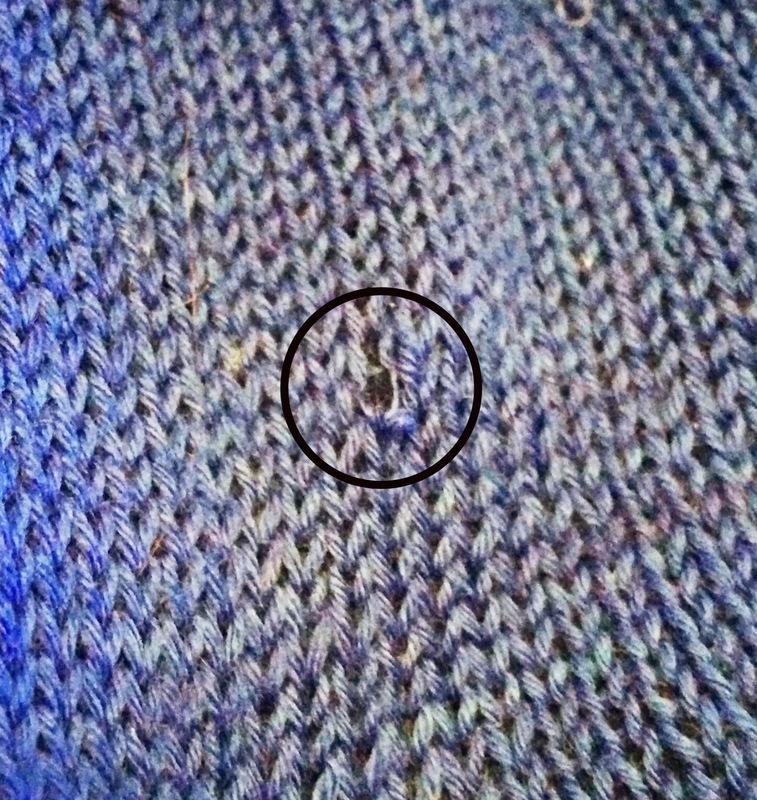 So it was only once I was about to photograph it that I noticed a spot where only one of the plies of the yarn had been knit. I nearly cried. So I used a length of the left over yarn and picked up the remaining plies and wove it in. Then I decided to inspect the rest more closely and found another two places I had done it. I repaired those two. 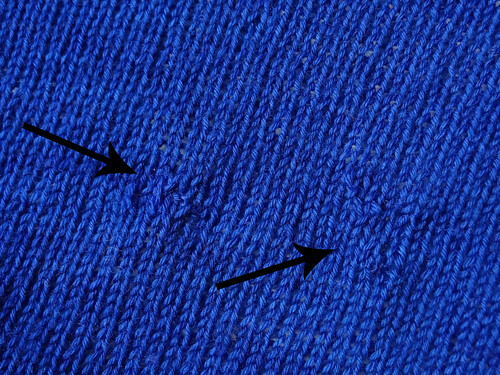 The fix is pretty invisible, but I think it would have been even less visible if I'd spotted those weak spots before blocking, as the the fibres would have been more relaxed and even. However, these holes and the mammoth task that blocking this behmoth was, were the only slightly dim spots in my pleasure during this project. 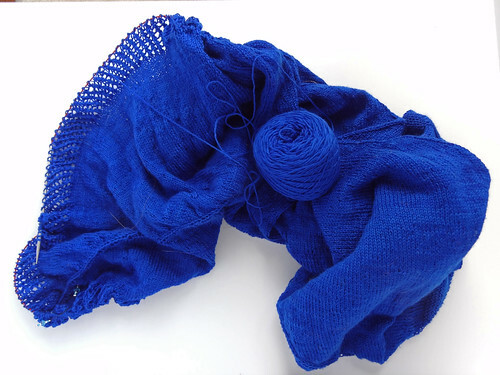 It was simple and straight-forward to knit, which left me free to enjoy the feel of the yarn as I stitched. Martina Behm really is a genius at these types of simple, fun and very wearable patterns. In fact, since photographing this garment, it's barely left my body. This really is a perfect garment for me. 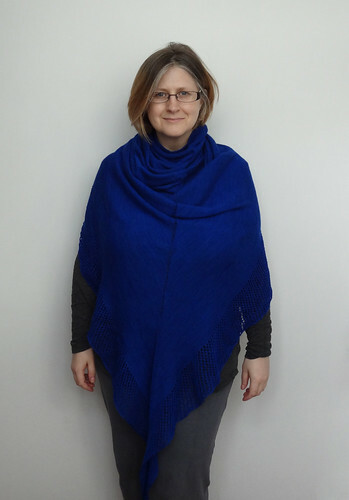 I spend a lot of time indoors so I don't often need thick or heavy sweaters to keep warm, so having a heavy lace weight shawl/cowl/poncho to wear is, usually, just what I need. It's such a flexible design. 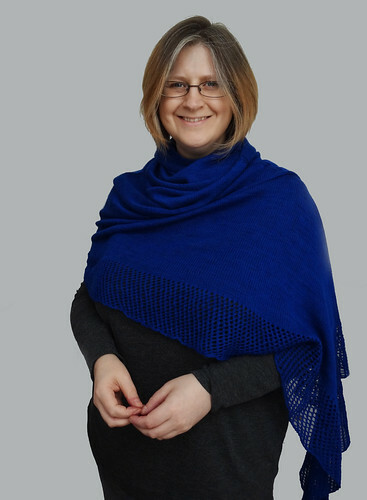 I love how the shape means it can also be worn as a thicker shawl if you are looking for a more traditional method of styling. It is quite substantial when it is worn like this, but it is still a generous size. Having double thickness means it is warmer around the back and arms,whilst worn like that. Though, it is still warm when being worn like a poncho. 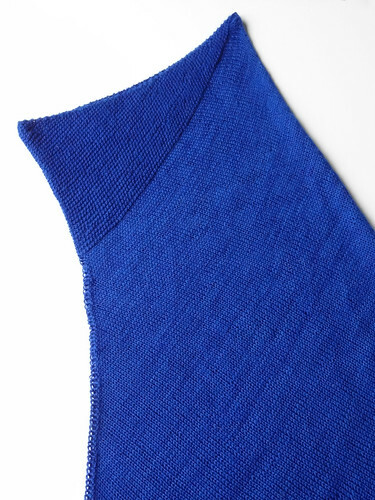 The neck of the garment is quite small, which could lead to overheating, and if you have broad shoulders, like I do, the poncho will ride up and scrunch up around the neck. I think if I was to make this again (and I'm very tempted to) I would make the neck a little wider and increase more quickly at the beginning. This would mean the poncho wouldn't ride so far up. I like that I can swivel the poncho round so when I'm lying down, and a bit chilly, and I can put the longer side over my body. I think wearing it this way would be perfect for in the car or in my wheelchair, where my back is warm and my front is cooler. It's like a very pretty blanket! 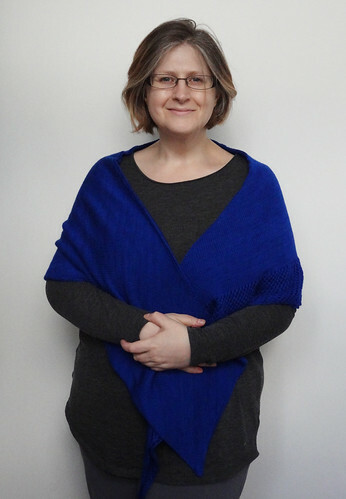 The thing I really love about this garment is being able to transform the poncho into a cowl that will keep out the most bitter chill as all the layers of merino bunch up together around the neck to create a warm cocoon of air. I feel so stylish, when it's worn like that. 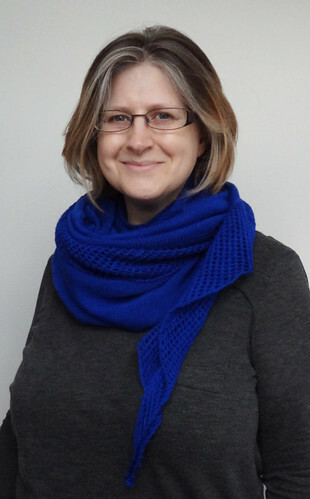 I think having a cowl that can be worn with a coat and then swiftly turned into a poncho for wearing, once you remove the coat, is a very clever and useful thing to own, and I really am tempted to make another one. As this is definitely a cool weather garment, I don't think I would wear this version on a Summer evening, because I suspect I would be too warm. 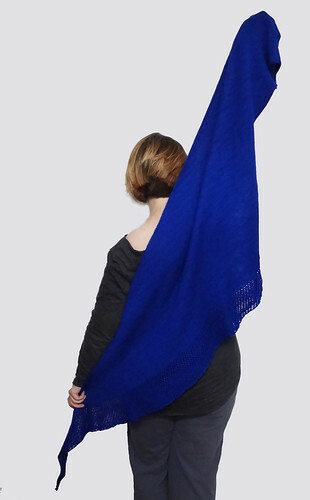 I would consider making another version in a true lace weight yarn that has maybe a silk, bamboo or tencel content. I might even have the right yarn in stash, Posh Yarn Sadie, which is a merino/tencel blend in a lovely neutral colour. I think a Viajante, in this yarn would be perfect for the Summer months, or nights out, with that gorgeous sheen. I am really tempted to wind this yarn and start right away! That's how much I love this project, both knitting it and wearing it. However, I will try and be disciplined and resist winding the yarn, as I have other projects that need attention. Don't be surprised though if you see this yarn in a couple of months. Yes, I would make this again and recommend others do so too!